Throughout the course of mankind's history, certain artistic endeavors have met with such critical acclaim that they stand as crowning achievements in their respected fields of culture. Michelangelo's Pieta, DaVinci's Mona Lisa, Beethoven's 9th Symphony and Tolstoy's War and Peace are all considered the pinnacle upon which all subsequent works would be judged. In the world of Cinema, two celebrated films have been at the core of a debate as to which is the greatest film of all time; Orson Welles’ Citizen Kane and Akira Kurosawa’s Shichinin no samurai. Although it’s a technical and cinematic masterpiece, Citizen Kane has one glaring fault that keeps it, in my eyes, from being classified as the zenith in all of film history. The main characters behavior is disturbing and reprehensible, while the storyline is cold and caustic, leaving the viewer with no desire to view the film repeatedly. Kurosawa’s Seven Samurai is the complete opposite to this profile and strikes every emotional chord with a velvet hammer, never too hard, never too soft. In the beginning we empathize with the farmer’s plight, at the mid-point we agonize with the samurai over the stacked odds against their success in the impending battle, and in the end we cheer their victory over the evil, loathsome bandits. Clocking in at three hours and twenty-six minutes, this epic film proves that in the hands of a gifted artist, time is no constraint. Kurosawa moves from character development, to introducing a couple of key sub-plots, and finally to a glorious climactic battle with an ease and grace that had heretofore never been seen on film. Upon reaching the end of this exhilarating ride, the viewer is left with one ardent desire, to sit back and repeat the journey. I myself have jumped on this roller coaster close to fifty times, and still have not tired of the excitement. Every scene is essential to the overall structure and pacing of the story, nothing tedious or superfluous. When this film was given its original international release in 1956, Toho Studios decided to scale back the running time from 206 to 160 minutes, cleaving over 45 precious minutes. The end result could best be described by quoting a character from another favorite film of mine, Amadeus. When he recounts the genius of Mozart's composing, Antonio Salieri states; "Displace one note and there would be diminishment, displace one phrase, and the structure would fall". Devoid of the sub-plots and character development, the film becomes just an action picture that begins to take on the resemblance of the American remake, The Magnificent Seven, a great film in its own right, but one that fails to reach the strata of its predecessor. This would also be a turning point in the careers of Toshirô Mifune & Takashi Shimura. After Shichinin no samurai, Mifune's star would rise to a level in Japan, equivalent to that of John Wayne in the United States. In that same year he would be cast in Hiroshi Inagaki's Miyamoto Musashi, the first part of a trilogy based upon the popular novel that has been described as the Japanese Gone with the Wind. He would be the lead in every Kurosawa film for the next 11 years, until a dispute would sever the most successful pairing of director and actor in film history in 1965. Shimura, on the other hand, would be relegated to supporting character roles in subsequent films by Kurosawa and would make his final appearance in Kurosawa’s comeback film Kagemusha in 1980. He would pass away in 1982 leaving behind a trio of memorable performances in the early Kurosawa masterpieces. His versatility as an actor would forever be immortalized on screen as the woodchopper in Rashômon, Watanabe in Ikiru, and as Kambei (the samurai leader) in Shichinin no samurai. The differences in personality and the diversity between these three characters prove that, with all due respect to Toshirô Mifune, Takashi Shimura was the more multifaceted actor. I have seen this only once so far and it length keeps me from pushing it back onto the to-watch pile already. However, I want to point out that I also found the length to be of no issue at all. I found no dragging anywhere and attention is held at all times. Before watching it the first time I thought "How will sword battles compare to gun fights? Can they keep it exciting still?" Well, Kurosawa does it and then some. The battles shows in this film are excellent. I wrote this review a few years ago, the number's higher now. I said the same thing about Throne of Blood. On Tuesday 3/23, Turner Classic Movies will be dedicating the whole day to films of Akira Kurosawa. Seven Samurai is on at 9:30PM, I guarantee, I'll be watching it again. I own the re-release of the Criterion release. I heard, I believe, they are prepping yet another new transfer for Blu-ray (I thought they had already done that last time...). I may have to double-dip. Citizen Kane has one glaring fault that keeps it, in my eyes, from being classified as the zenith in all of film history. The main characters behavior is disturbing and reprehensible, while the storyline is cold and caustic, leaving the viewer with no desire to view the film repeatedly. He was quite wrong of course. Regards Mifune and Shimura, I loved Drunken Angel for how it put them together. Well, if we did discuss it, there definitely wouldn't be any fireworks as our usual discussions feature. I love Kane from a purely technical viewpoint. Gregg Toland was a freakin' genius! Yeah, I read that review when I first joined up, and decided that, because I was new to the site, I'd wouldn't comment on his observation. This gets better for me with each viewing, although the one time I saw it on 35mm certainly stands out. I'd go so far as to consider this Kurosawa's best film, however, my personal favorite of his is most likely High and Low. I really do wish his non-samurai films would get due recognition. however, my personal favorite of his is most likely High and Low. I recently bought the Criterion release of this. Will have to try to watch it soon now. Who has noticed Google's cool new logo? Very nice! But my favorite is still the one from St. Patrick's day last week. I'd go so far as to consider this Kurosawa's best film, however, my personal favorite of his is most likely High and Low. 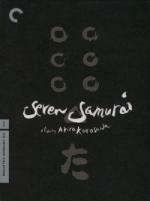 I really do wish his non-samurai films would get due recognition.